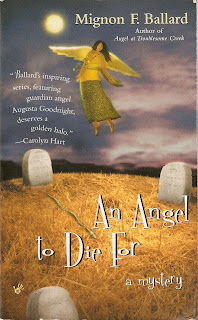 I read the first book in this series, Angel at Troublesome Creek, and thoroughly enjoyed it. This was such a let down. I really wanted to like it, but found myself bored with it. It was a short book which is the only reason I kept up with it. Another book like this and I'm going to have to drop Ballard from my author list. However, my mom enjoyed the book. It all begins on a frigid day when Prentice Dobson finds the empty grave of her Uncle Faris. The family happens to have a family graveyard not too far from the house. I find that a little creepy. One time when we were driving to Texarkana and going through these little towns, we kept driving past cemeteries across the street from the houses. My husband and I cringed at the thought. Having it on the property would be highly unsettling. The next morning, Prentice awakens to the smell of coffee. Odd, considering she's the only one staying at Smokerise, the family house. She goes downstairs to find Augusta Goodnight, her temporary guardian angel until her permanent one shows up. Prentice manages to take this all in stride without screaming in terror and calling the police. She does call the police about the empty gravesite, though. Alas, Prentice has too much on her hands, the death of her father and estranged sister, losing her job, the man she wants to love leaving for England, then she finds out she's got a missing baby nephew. While trying to track down her missing nephew, she comes across a couple more bodies, another makeshift gravesite, some prowlers, and some odd characters. All this and the book is still boring! There's no real action and I found myself getting annoyed with Prentice. She's paranoid, but takes people at face value. If someone says he's a good person and on her side, not only does she believe him, she agrees to let this person in her car. Yet, she jumps at every shadow. The mystery started off the story, but quickly fell to the background once she found out about her nephew, Joey. For the rest of the book, it was Joey's story. I'm not a mother (yet), but I was getting a little bogged down in the Joey saga: where is he; who's family has more rights to him; who's going to raise him; who does he look like; etc. If this were a touching story about a woman finding her nephew, about two families coming together in the best interest of the child, I would've been touched. As it was, I was looking for a mystery, instead I found a Chicken Soup for the Soul type story (which I don't read). Why did I continue reading this? It's akin to finding yourself in quicksand. By the time I realized I was stuck, it was too late. Oh, well, I'll dust myself off and move to the next book, which is starting off good and is making up for this one. We lived next door to a church in Benton, WI in 2002. We had a graveyard practically in our backyard. It wasn't creepy though. It was sort of nice. But we're weird, I suppose.